Some may say that double-barrel surnames are somewhat pretentious at the best of times. Those with double-barrel surnames may defend their status by asking why a woman would give up her name when married. That may be all well and good, but these ten shockers simply cannot be justified under ANY circumstances. What do you think…? 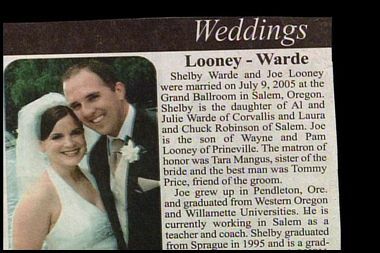 This hapless couple from Oregon were married on 9th July 2005 at the Grand Ballroom in Salem. The question is… did she adopt his double-barrel name or did she insist on creating a surname that will condemn their kids to years of taunting at school? Your guess is as good as ours.